Romeo and Carmie were soooo.. happy to see me when I went to pick them up today. They were full of energy and wanting to play. I took Romeo and Carmie today to get their ears cropped. The fourth pup left today by plane .. Kindle flew home to be with his new family in Salinas, California. Well, I think I have a winner as far as expressing how excited he was to be taking his pup home!! Jay and family came by to pick up Cleo today. Jay was smiling from ear to ear, literally! His enthusiasm was great. It seemed he couldn't wait to get out the door and bring his girl home. At one point, Marjorie had to finally ask for a chance to hold Cleo. I really enjoyed them! Kelley's big day finally arrived! She and her mom came by this evening to pick up Emmie .. and FINALLY bring her home! This will be one spoiled pup! A couple hours after Kelley left, Craig and his crew came by to pick up Betty. They have been pretty anxious for this day to arrive as well. They all seemed very happy to be taking Betty home to start her new life with them. Cody emailed me to let me know the pup we have known as "Beau" would now be called Kindle. Cody called today to notify me of his decision .. he's taking "Beau" and is very excited about bringing this little guy into their lives! Kelley came by this evening .. brought her roommate. She is getting especially anxious to bring her home. The big day will be Friday. Notified the waiting list of the new pup being available. In less than an hour, I heard back from Cody in California. We spoke on the phone. Decision would need to be made tomorrow. Susan from Hardwick, Vermont gave the final word .. she is going to claim the black female tagged purple and she will call her Carmie, short for Carmen the Doberman. Susan said she likes Karma but it is too close to Sheba, her 8 year old Shiba Inu. I was notified this evening that Stefani was not going to be able to take "Beau". Due to circumstances in her life, she didn't think it would be fair to bring him into the craziness in this time of her life. She was deeply saddened by the decision but knew it was the right one to make. Kelley came by again to get another puppy "fix"! I think she is getting anxious for her little girl to come home!! Gave the pups shots today. Not one of them gave me any trouble about it! We also set them up in another part of the yard. Wanted to give them another area of the yard to play in when we can't be outside. Based off specifications given to me through a phone conversation with Bob, I recommended to him which pup to pick. He confirmed that the pick was fine and gave her a name .. the black female tagged green is now known as Rose. New development with one of the black females .. family had to back out (was going to be known as Karma). So, currently working through list again to find a good owner! Craig and his wife came out for a second visit today. He wanted to make sure they were making the right decision .. they made their pick on a pup. This means we know who to call Betty now! 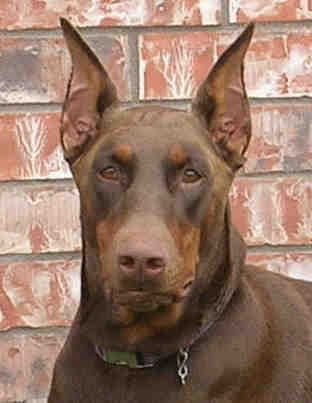 It also means that Kelley gets to put a face to her pup as she gets the second red female. Tried pups on completely dry puppy food today. They have been eating it soaked .. but not that well. I wanted to see how they would do with the dried. They seemed to take to it quickly and in the coarse of a day or so, they are eating the dried food REALLY well!! This evening we introduced them to food. They loved it! Mom has started the weaning process, primarily because it is just becoming too painful! Kelley brought her dad out for the first time to see the pups. Her mom was sure to tag along, too! Made a new set up for the pups outside .. the trampoline is now serving as a protective pen! See 4 week pictures to check out how well this is working. "My daughter has decided that the pup's name will be Rebel of Ebony Storm. She will call him Reb." The pups had two different sets of visitors today: (1) Jay, Marjorie and children and (2) Craig and his family including his father from Phoenix. It was fun getting to meet two sets of owners today face-to-face! Also, since we had owners coming out to see the pups, we went ahead and put tags on the pups today. Individual pages for the pups will be up later this week. It was a beautiful day and we decided to introduce the pups to grass. This is one of the first litters to not be that taken back by the green stuff. They were just fine with it! And, had fun playing in the new surroundings. Pups' had visitors today .. Kelley and her mom came by to see how much they have grown. This is a fun age to see them because they are very much giving their best effort at playing, including little growls, but they do not have full control over their little bodies and often go tumbling away from the sibling they were trying to "attack". I trimmed the puppies' toenails for the first time today. They were getting a little sharp and mom's getting some raw spots on her belly (from nursing). All did fine on the first paw but once they realized I was doing something to them, they protested! The little ones are really starting to play cute now - too fun! The pups' teeth have cut through the gums. The pups officially outgrew the laundry room! We moved them out to our garage today which is just down the hall from the office where we spend a good portion of our day. Scarlett is much happier. The pups got to where they were moving around so much that she really needed to be able to have her own space, too. Now, she can get to the pups when they need her but she can also take a break when she needs it!! The pups are getting better at walking everyday. And, they are able to sit up the normal way that a dog would sit. Also, their wobbly way of playing is getting much better. It is funny because they will actually try to somewhat lunge at one another which results in a roll to the floor. The control factor is still a little off! Teresa notified us that their red male will be called Romeo because "they know he will be a lover!" Okay, it is official .. the pups can hear. Their ears are not fully open but they are definitely hearing sounds. We were spending time with the pups and our two youngest children were a little noisy. I noticed the same curious look in the pups' faces as I noticed when their eyes were first opening. Pups' are getting use to bathtime and finding it more relaxing than stressful .. not that is was a lot of stress for them before, they just liked to put up a little protest when the water first touched their coats. It appears that the pups are starting to be able to hear. My daughter was singing a song this evening before saying goodnight to the pups and Scarlett and a couple of the pups seemed to respond. The pups are able to get up on all fours now and take a few steps. It ends with a splat to the floor! They are wobbly when up but really are quite strong. The pups took a trip with us out to Rockwall, Texas to spend the Easter weekend with the grandparents. We also brought Aggie (pups' grandmother) and Brindie (our Boxer), and, of course, Scarlett. Scarlett has no problem with Aggie and Brindie being around so all rode in back of our SUV .. 1 hour and 15 minutes and they all did great! Once we got to my parents', we got mom and pups set up in their laundry room. This is always a fun moment to witness .. the pups started trying to "play" this evening. Right before bedtime, I checked on them and noticed a pup "growl". To my amazement, it was actually TRYING to chew on another's body parts. As I sat with them awhile, I noticed a few others doing the same thing. It is really funny because their attempts to play just causes them to lose balance and tumble over. Eyes are completely open! It is fun having them look at us with such curiosity. Stefani notified us that she is going to be naming her red male Beau. Eighth and last pup sold today .. Jay and his family will be the proud owners of a black/rust female. The eyes are started to peep through. They are certainly not able to see yet but definitely starting to become more and more aware of things. And, finally my touch seems to be about as comforting to them as mom's. At first, if they are awake, all they want is mom's milk! Angela notified me that their black female's name will be Karma. Here is what she wrote, "We've decided on a name ---- *Karma* We think it's perfect!! You can post it on the site, it's official. It fits --a sweet little pup we weren't sure we'd get. We are so excited! Angela"
Bob from Phoenix, Arizona confirmed today that he wants a black/rust female. That makes the seventh pick for the litter. Pups got their first bath today. Most of them protested .. but not too bad. It was a very quick process so they were soon back with mom and happy. Kelly wrote today to let us know she has narrowed the name selection for her red female down to Ruby or Sammy. She will go with what feels right at the right time. Angela from Merriam, KS confirmed today that she and her family would like to claim a black/rust female. This would be the sixth pick of the litter. That means there are only two pups who have unconfirmed owners .. but I hate to break the news, we are waiting on one decision to be made. Once made, that will make for a sold out litter. Craig informed me that his family has decided on a name for their red female .. she will be known as Betty. Fifth pick was confirmed today. A red male will be living in Austin, Texas with Richard. The pups are 1 week old today. They are one of the strongest litters we have ever had! They can scoot around halfway across our laundry room and find mom. I am just amazed! The pups had visitors today - Kelley and Leslie came out today. Kelley was getting first pick on the black females. After falling in love with Scarlett, she has now decided on a red female. Third pick was confirmed today. The black male will be living with David and his family in Texas. Fourth pick was also confirmed. A red male will be living in Mt. Shasta, California with Stefani. The pups are noticably stronger today. I am truly amazed, actually. They are able to push and scoot themselves around really well considering they are not even a week old. Today the pups go to get their tails docked and dew claws removed. All did fine. First pick is confirmed and the person (Kelley) making the pick lives close by (McKinney) and came out to take a peek at the pups. Second pick is also confirmed. A red female will be living in Dallas, Texas with Craig. April 1, 2006 - Happy Fool's Day! Scarlett pulled a good one on us. She started acting really funny today. And, being Saturday, we were busy with soccer games. We had one early game and one late game. It was between games that I noticed her behavior altered. Before leaving for the second game, I made sure she was in the room she and the pups would be later occupying. Well, sure enough, when we got back, she had already had two pups - 1 red and 1 black male. She had done a beautiful job. I just felt bad because I wasn't there for her! But, the whole rest of the evening on into the wee morning hours, I was there helping Scarlett 100%. She is such a good mom! Unfortunately, the third pup born was still born. This was a first for us and I didn't want to accept it at first. A sad loss but every pup after that was born healthy and full of feisty life. Not dwelling on that, let's count the next as the third -- a black female, fourth a red female, fifth and sixth both black females, seventh a red male, and to finish it off - eighth was a red female. The last pup was born around 1:15 a.m. I wasn't completely convinced she was done at that point but around 3:30 a.m., Scarlett's breathing had slowed down and she fell fast asleep! I went to bed, too. All in all, a good experience.